Since November is National Peanut Butter Lovers Month (reality: every month in this house), I wanted to share one of my favorite combinations: peanut butter and chocolate. My one packaged candy vice is Reeses Peanut Butter Cups. I really, really like them. Although not the pumpkin shaped ones or the Christmas tree shaped ones. So go figure. When I have a 'not so great for you' food craving, I try and take apart what it is about that particular food that I love. Reeses have a tinge of salt, a creamy peanut butter filling, and chocolate shell. I can make that happen. 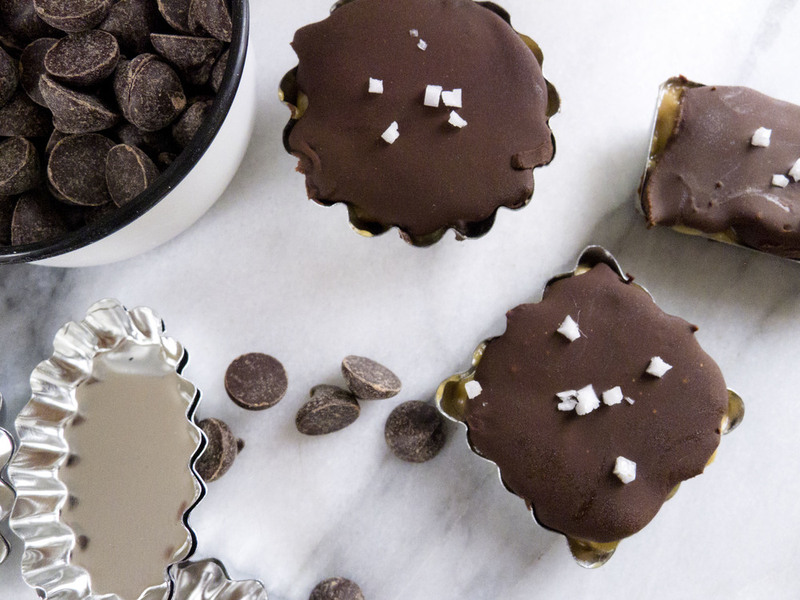 And now you can too: Healthier, Make At Home, Chocolate Peanut Butter Cups with Sea Salt. To make them pretty and give them the dual layer shell I wanted, I used small tart tins (here's a similar one with a floral theme). While the first layer of chocolate is in the freezer, mix peanut butter, powdered sugar and milk in a bowl until smooth and combined. Remove the tins from the freezer and add the middle layer of peanut butter. Depending on how small your tins are, you may have extra filling. Tap on the counter. Freeze for 15 minutes. Remove and add top layer of chocolate. Tap to remove air bubbles and sprinkle on sea salt. Freeze for 15 minutes. Store in the fridge. This is by no means a 'healthy-go for it all the time' recipe. This is a simplified, less processed version of a traditional junk food I happen to fancy. But by making it dark chocolate, you're adding antioxidants. And by picking a smart peanut butter with JUST nuts and maybe a little salt, you're reducing the sugar. That's something I can stand for. What's your junk food vice?